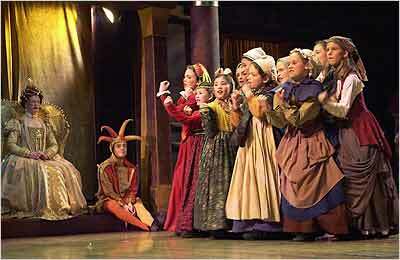 The cast of The Christmas Revels. The Rockettes are back with their high-kicking toy-soldier routine for more than 200 performances as often as six times a day. Plus, after weeks of negotiations, the live orchestra has returned. A “broken” view of the holiday tale, starring two Jewish kids in search of the meaning of Christmas, a lapsed homeboy, and Bob Cratchit, reality-TV star. For holiday cynics, this satire delivers comic relief: Each of Santa’s reindeer share North Pole gossip, ranging from Mrs. Claus’s alcoholism to St. Nick’s bestial tendencies. • $15/adults; $10/students and seniors. George Balanchine’s Nutcracker, which premiered in 1954, is the standard-bearer for this sugarplum classic. And the NYCB stages a whopping 45 performances to prove it. The Urban Ballet Theater resets the perennial en pointe on the Lower East Side where a hip-hop battle ensues between ‘hood rats and toy soldiers. Chinese, flamenco, and salsa influences play into the choreography. • $15/adults; $10/children under 12. Phillip Stern’s tuneful adapation of Charles Dickens’ fabulist tale about an old geezer’s ghost-guided quest for a second chance at life. • November 27, 2 p.m.
Obie award-winner Hoffman (The Book of Liz) returns to Joe’s Pub—where her cabaret act, The Kvetching Continues still reigns as the longest running show in Joe’s Pub history—with brand-new material. Expect her usual onstage antics (Broadway bashing and her disdain for little children), but unlike last year’s run which included gentile-friendly numbers about Christmas, this year Hoffman promises a Chanukah-only kvetch-fest. • Mondays in December, 7:30 p.m. and 9:30 p.m. The ghosts of Christmas past, present and future are fed up in James Comtois’s comedy. See what happens when they forgo teaching life lessons and insist on having some fun for themselves. • December 8-17, Thursday-Saturday, 8 p.m.
Thorton Wilder’s poignant one-act recounts one family’s intergenerational history using an extended meal as its central metaphor; a modern update of the Dickens chestnut (by the New York Theatre Experiment ensemble) features a fashion-forward, Anna Wintour-esque lead as Scrooge. This five-man band brings their fiddle, bouzouki, bodhrán, and other Irish instruments to Joe’s Pub for a night of traditional song and dance. Highlights include a reenactment of the Wren Boys, an Irish take on Christmas caroling which also incorporates Halloween-like costumes. Special guests, including local step dancers, will also be in tow. • December 11, 3 p.m., 7:30 p.m., 9:30 p.m. Yet another version of Tchaikovsky’s ballet, but this one-hour production, based on lithographs from the early 19th century English Toy Theatre, is designed specifically for children and families. • December 3, 11 a.m.; December 9, 10 a.m. and noon; December 4, 10, 11, 17, 18, 11 a.m., 1 p.m., 3:30 p.m.
• $30; $25/children 12 and under. A cast of eighty re-enacts an Elizabethan Winter Solstice with Morris dancing and a slapstick Mummers play. In a year rich with biographies of the Bard, the incorporated tribute to Shakespearean clown Will Kemp is particularly well-timed. • December 9, 8 p.m.; December 10, 2 p.m. and 8 p.m.; December 11, 2 p.m. and 6 p.m.
David Parker and the Bang Group combine comedy and contemporary dance to reinterpret The Nutcracker with a downtown slant. Everything about the ballet has been reinvented, from the offbeat soundtrack (remixed from the original score) to the vaudeville-style performance, where dancers sing, hoof, toe-tap and even booty-shake. • December 15-17, 7:30 p.m.; December 18, 1:30 p.m. and 7:30 p.m. The Met screens short films from its unique archive. • December 18, 12:30 p.m.
• Metropolitan Museum of Art, 1000 Fifth Ave., at 82nd St.; 212-535-7710. • Free with museum admission. An ensemble of actors adapt comical tales written by 5- to 11-year-olds into a vaudeville-style revue. • December 18, 2:30 p.m.
• $12/adults; $10/seniors; $7/members and students. A quartet of plays (with songs like Wiggle Worm’s Surprise) from the internationally acclaimed children’s theater company known for its cardboard costumes and brightly colored sets. • December 18, 11 a.m. and 12:30 p.m.
What happens when the Borscht Belt goes to Bethlehem? Local comedians Brad Trackman, Jon Fisch, Todd Barry, and Jessica Kirson are going to find out. • December 24, 7:30 p.m. and 9:30 p.m.
• $16 cover, plus two-drink minimum.